the Hand UP | Beer, Bills, and Bacon… HUP! I guess the disc brake revolution(pun intended, did it work?) is coming whether people like it or not. TRP is the latest to release a model geared mainly to cyclocross racing. CX Mag released a review already so there’s no need for me to try to bullsh*t some text about pro’s and cons of these brakes. But I did find this cool video to share of them testing! Red Hot! Here is a cool product recently released by Knog, the Blinder Road. Now that cross is over for a while (I know I know, Sea Otter!) I’ve been trying to get out and commute a bit. When you have a 60 mile commute home, lights become a necessity. I’ve been using the Knog Blinder 4 for a while now and love them! Easy to use, great looking, and bright. Well now Knog has outdone themselves with the new Blinder road. I’ve recently had a chance to use these on a couple commutes here in LA and am thoroughly impressed. Super bright, super light. I’m definitely not passing up any opportunity to get these back on my bike in the future! 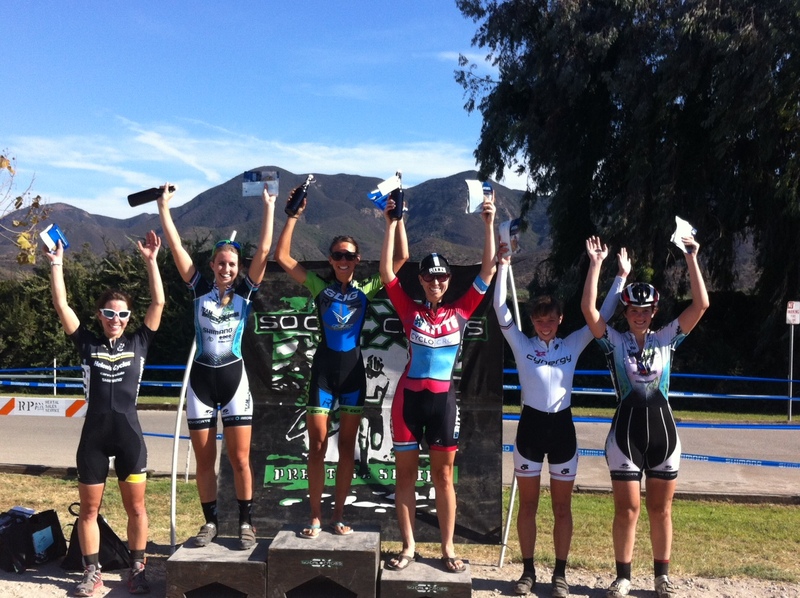 We’re only three weeks into the SoCal Prestige Series, and we already feel like the season is moving by way too fast. We gauge the amount of time past not by a calendar, but by how much the facial hair in the single speed field has grown, changed, and morphed. Man, time really does move fast sometimes. Some of those beards are already getting fancy! 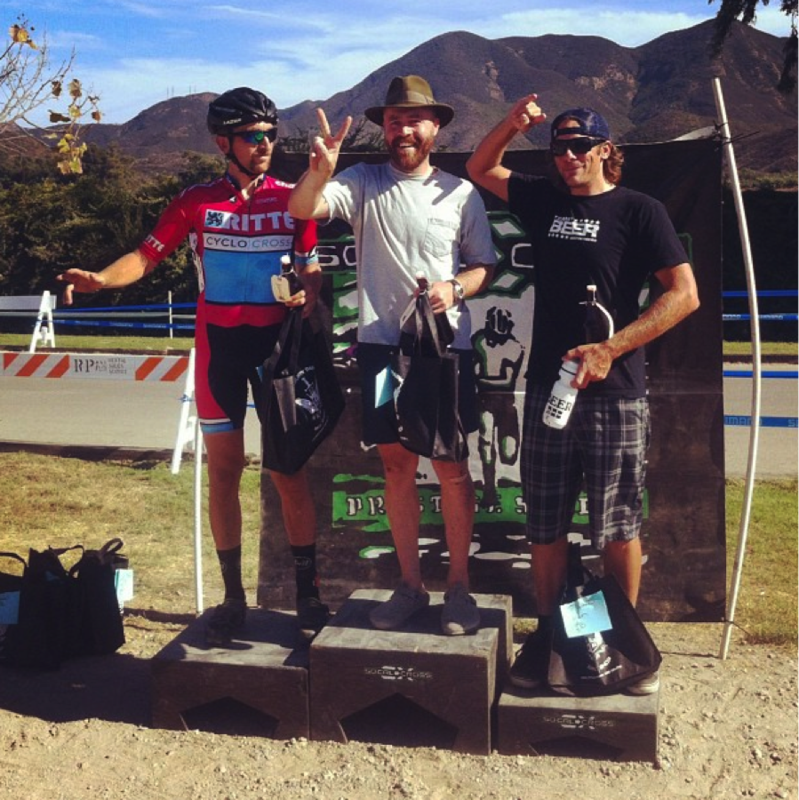 Week 3 of the SoCal Prestige Series had the team heading north to the Pacifica Crossfest in Camarillo, CA. Racing bikes is awesome no matter what, but it’s even awesome-er if it means you’re doing a bit of good at the same time. Saturday’s race was held at Casa Pacifica, which is a center for kids and families facing challenging times in their lives. Each year the race fees collected at this event go directly towards supporting Casa Pacifica. Last year’s race fees helped buy BMX bikes for the kids, and this year’s funded a trip to Knotts Berry Farm on the day of the race. Huge kudos go out to Dorothy Twitchell for taking our love of racing and making something really special happen because of it. 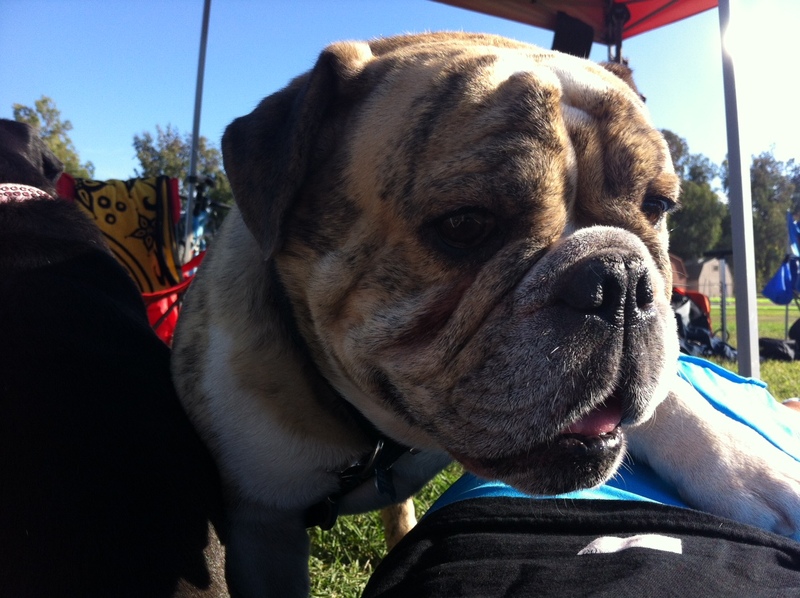 Henry and Gabby relaxed beneath the Official Ritte CX Team Tent while racing got started with Men’s and Women’s Singe Speed races. It’s no secret that Danger is all about the silly speed, so when he toes the line, he’s out for blood. The other contenders should be scared no matter what, but if G$ toes the line too, then they better be shaking in their carbon soled shoes. Gareth fights the good fight for Danger, stopping at nothing to give him the edge. This weekend we learned that apparently hipsters can play a little dirty too. G$ led out the first lap until Danger went crazy and took off on a flyer. Doing what he does, Gareth then slowed the pace and blocked people in all the technical sections, letting Danger open a gap. The hipster crowd was having none of that, so they banded together in tattooed rebellion and began their mission to take Danger down. Ultimately, they were successful. Danger eventually got caught on the last lap, and a bobble in the sand pit cost him the victory as he settled for 2nd place to some guy who reeked of malt whiskey and bad decisions. When G$ crossed the line in 7th, Danger was already on the phone with Ben Berden arranging to have Belgian’s best tattoo artists flown out. That should help, right? Come podium time, Danger was still a little confused by what happened on that last lap. 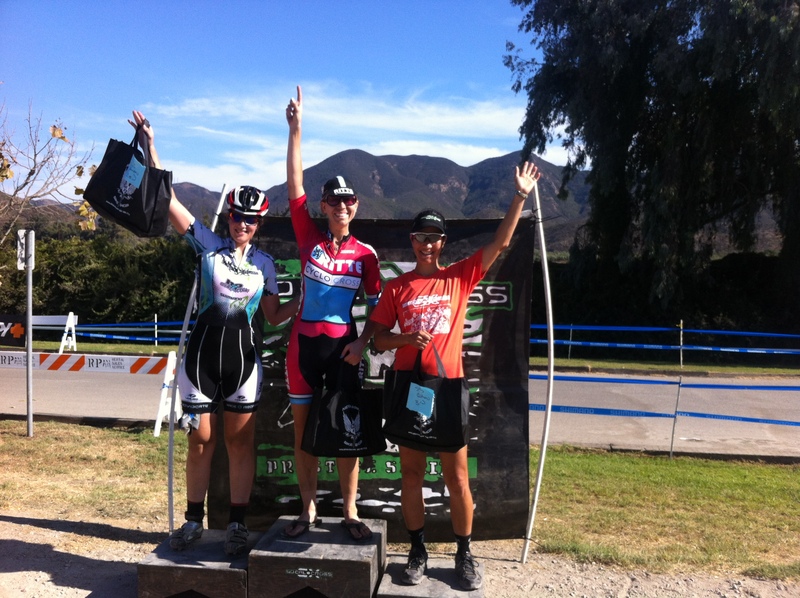 While Danger was too busy getting beat by a Leprechaun in the Men’s SS race, Scraper was busy showing the ladies how it’s done in the Women’s SS race. She led the charge on her way to a third straight SS win for the season. Rumor has it she has a secret tattoo that gives her super SS strength. 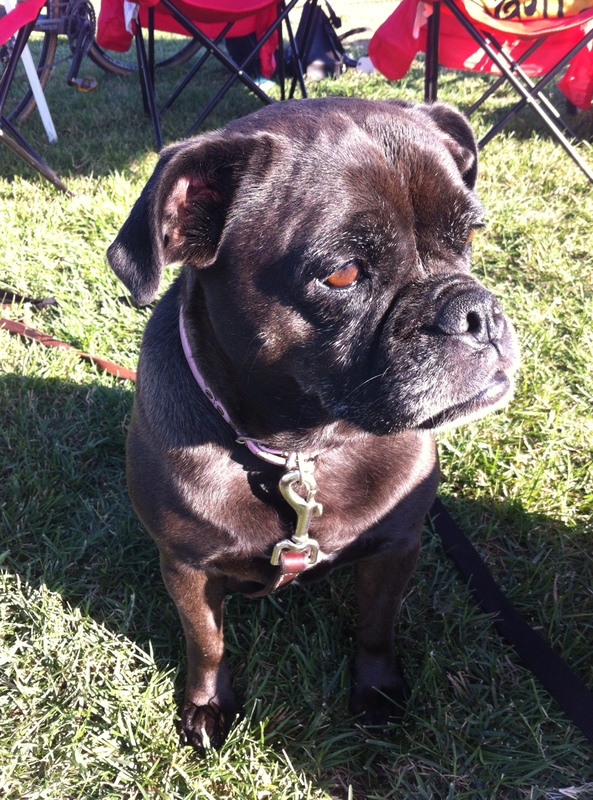 In fact, race organizers are considering handicapping her by giving her only ½ a gear in the next race. With barely enough time to re-apply her Mad Alchemy embrocation, Scraper hopped on her geared bike and went to battle with the Women’s Elite field. Feeling the effects of the previous races she got off to a slow start, finding herself in 8th position. After a couple stealthy passes in the sand pit and over the barriers, she started making her way through the field, ultimately realizing that she had a shot at catching the lead group. She kept her cool and picked off her competition one by one. She was pretty content when she found herself comfortably in 3rd, but then got sight of Miss Alexis Ryan and put in another good push. She caught up to Alexis, made a swift pass, and then rode with Alexis on her wheel for about a lap. Amanda was geared up to make a move and try to seal in the deal for 2nd, but a mechanical with less than ½ lap to go meant she had to settle for 3rd. Meanwhile, German superstar Carolin Schiff did her thing and rode away for her 3rd win of the season. Will somebody take that girl’s Visa away already?? The competition is tough this year, and it’s awesome to see such a strong field of ladies out there. What lookers too! Men’s Elite was the next order of the day and G$ was foaming at the mouth to get racing and try to improve on last week’s performance. He was literally foaming at the mouth–perhaps he was trying to help Henry and Gabby feel more at home. Racing started and the combination of technical sandpits and too many roadies on the course caused carnage to ensue. Luckily for G$ (and Danger who was learning how to ride gears about 10 places behind), the Challenge rubber-side stayed down and his legs stayed fast as he battled it out with SDG’s Anton Petrov and Mudfooter Ty Hathaway. 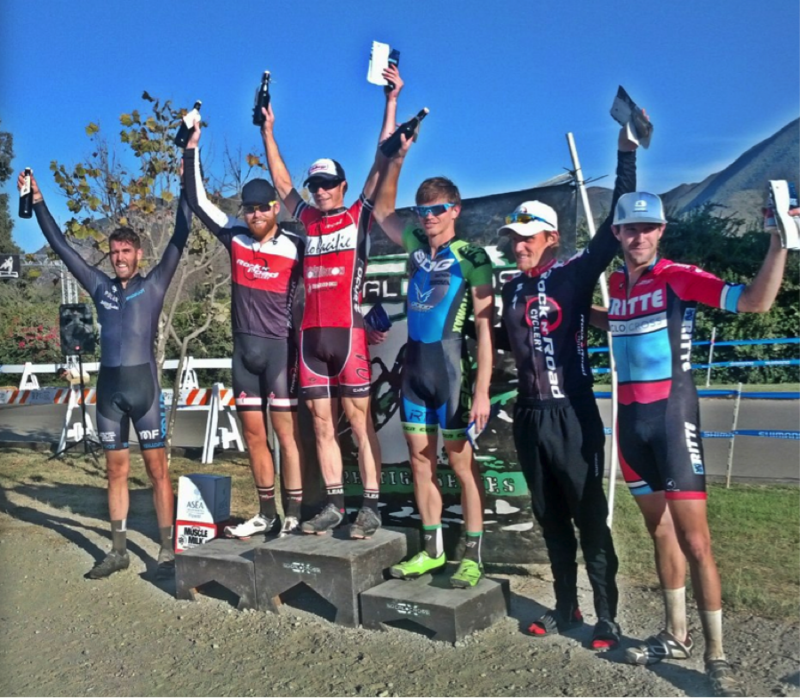 Gareth muscled to a 5th place finish, one better-ing his result from last weekend. Meanwhile, BP added another notch to his bedpost, bringing in his 116th Elite win. Gareth wants to be just like Brent when he grows up. When you ask G$ about his race, he may mention how he could’ve had more had power if he skipped the SS race, or how he’s thrilled to be doing well so early into the long season, or even how stoked he was to make some money with another strong showing… However, everyone knows that he was most excited about having Henry and Gabby there cheering him on, not to mention his lovely lady Dara, who’s almost as charming as the pups. 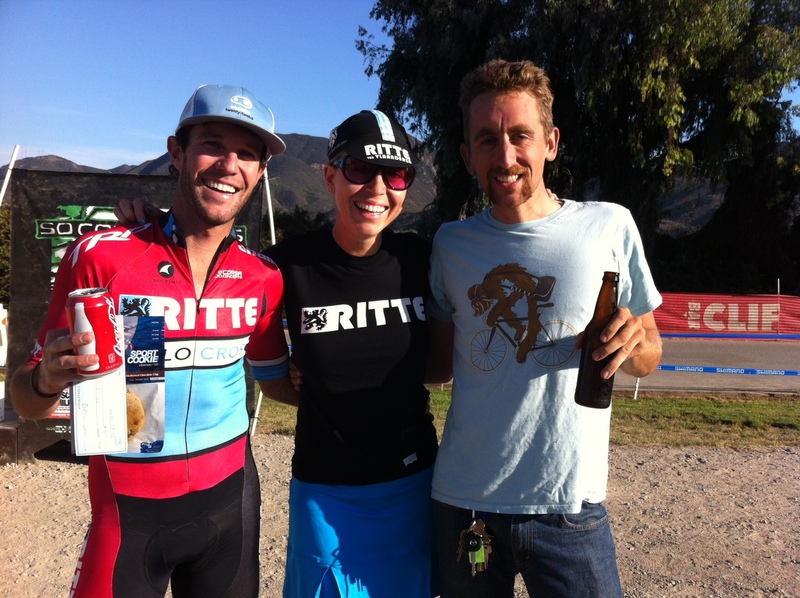 So the Ritte CX Team survived another weekend with good friends, good racing, and some pretty darn good results. There’s no doubt that things are getting heated as rivalries brew and series points start to stack up. Next weekend we head to Pomona for some nighttime Spooky Cross UCI racing action. Until then, keep the party hearty! Hmmm, for those of us who want a combination of fashion and function, I presnt to you the PUMA Cyclocross Fashion Sneaker. Now with a three-bolt cleat pattern and what appear to be a sole with low-tread pattern, your guess is as good as mine… Has anyone seen this or used it? Cheap Puma Men’s Cyclocross Fashion Sneaker from spear007 on Vimeo. What we you expecting something else? 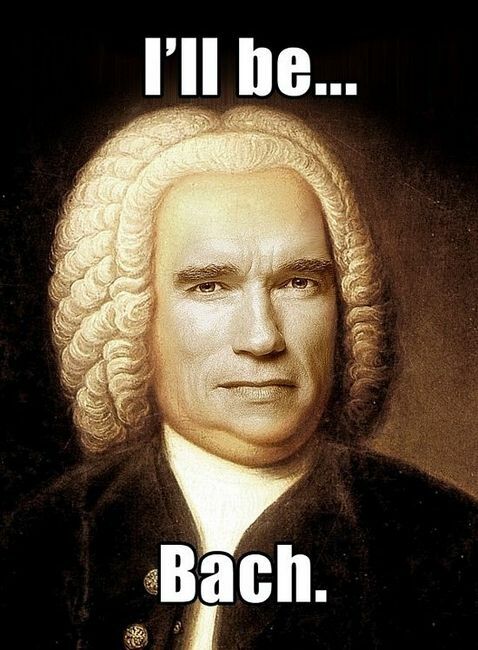 Perhaps you were expecting to see our buddy Arnold flexing his pectoral muscles or smoking a doob, we’ll you were wrong. But don’t cry, no, all is not lost. We all are wrong at times… even myself. 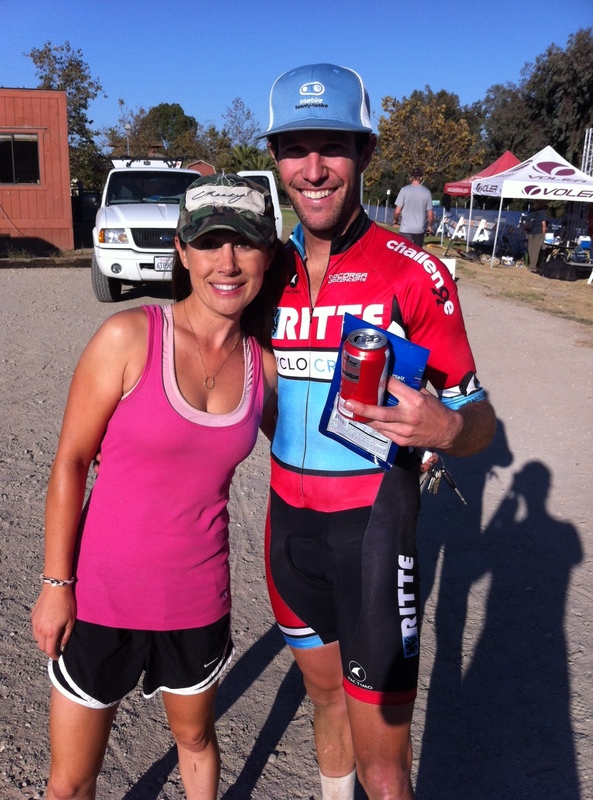 You see last year while keeping this blog update I put up a 13 Questions for Adam Myerson on the blog because I thought readers would enjoy it. How was I wrong? Well a few days ago I took a look at this sites web traffic and noticed a spike for traffic to the 13 Questions from Adam… and I assumed it was because people actually cared to hear what he had to say… WRONG! After looking at the search term referral data I found this: People don’t care about Adam Myerson… They care about Pauline Ferrand Prevot. I think Adam knew that when he answered question #4. Oh and by the way, they are mostly from European search engines. There is a special surprise in there for you too, see if you can find it! Adam, I promise once this site gets big enough I will try to get you a date with Pauline Ferrand Prevot. After I get a 13 Questions from Pauline Ferrand Prevot. 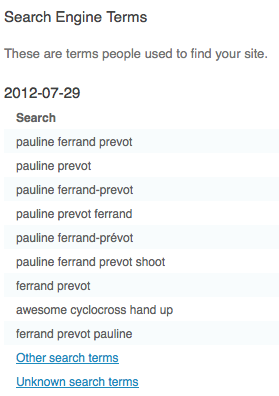 And yes I am just trying to boost web traffic by repeating Pauline Ferrand Prevot’s name. Now that cross season has come to an end, we find ourselves with a few awkward months to kill before we start salivating over how fast we are going to be next year and how much beer we will be drinking at every race. Until then some of us hit the road and some hit the mountain. For those roadies out there, Hollywood has gathered its finest to create…. Leaving me wondering if it will have enough to top Premium Rush in this years battle-of-bikes-on-thebig-screen.